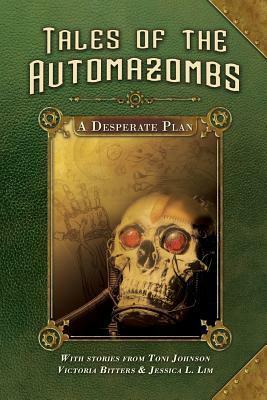 I’ve created a Goodreads giveaway for Tales of the Automazombs: A Desperate Plan! I’m pretty excited about it; it’s my very first giveaway. Ten people are going to win copies of the book, signed by all three authors! Click the link to enter! Looking for more stories to read? Like science fiction that looks and acts like an alternate-present dystopia until you get deep into it? A few years ago, I wrote exactly that: Earth Out of Place. I’ve decided to post it in serialized form on Wattpad. It’s free to read, and the first few chapters are already up! You can check it out here. I have news. Blog news! If all goes well, you won’t (or haven’t) noticed too much, but I’m now at tonij.com instead of .net. In the coming week, all of my social medias will be updated to be the same tonij.com. Oh and have you ever wanted to see how I work? Soon you might be able to! Not a story, I know, but this week’s terribleminds challenge caught my attention. The subject? Why I write. It’s a great question. It ties in with Gen Con, which has its own writer’s symposium (which I am totally at! Right now! Well, right now I’m in my hotel, but you get the idea). I have to say, at first, this question filled me with all manner of existential dread. As if the real question were “who the f*k said you could write?” So, I played whack-a-mole with that thought process until I beat it back down to whatever subconscious anxiety pit it oozed out of. My answer didn’t come easily. I toyed with the concept that I can’t not write, and that I have stories to tell. Both are true. I’ll keep writing as long as I’m able, and probably some time after that. I can be pretty crafty. And there are always new spaceships and dragons and robots and misunderstood monsters to write about. But that felt like surface stuff. So, I peeled back each layer of why until I reached what I think is the meaty center. Why do I write? 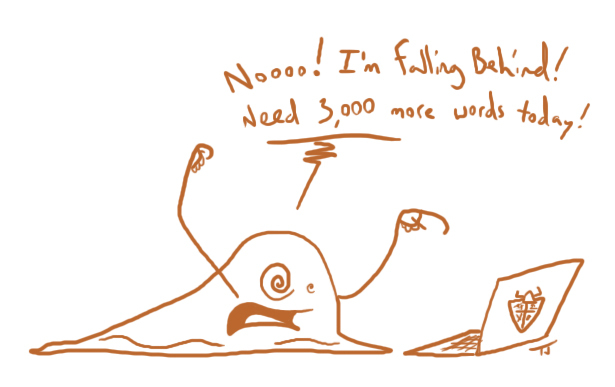 Why do I really, really write? I like affecting people. If you see me in the real world, I will probably try to make you laugh. It’s like that, but with more ink. Writing is like a concentrated feelings machine. When I can make you laugh or cry or get mad at a completely fake character as if they were real, that’s amazing. That’s what stories do, and it’s the best. Note the permanent typey fingers, the sleep-deprived crazy eyes, the blob-like mushy feeling from not moving until each day’s goal is reached, and of course the paranoia that I will not make it to the end. I’m working on fine tuning my novel for publication on Kindle and the cover art to go along with it. What do you think?